About two years ago a complete breakaway from the phenomenally famous war production model was scheduled by Willys-Overland, Willie Jeep’s pappy, and I was informed that a brand-new, conventional sedan was about to make its debut. It never did. 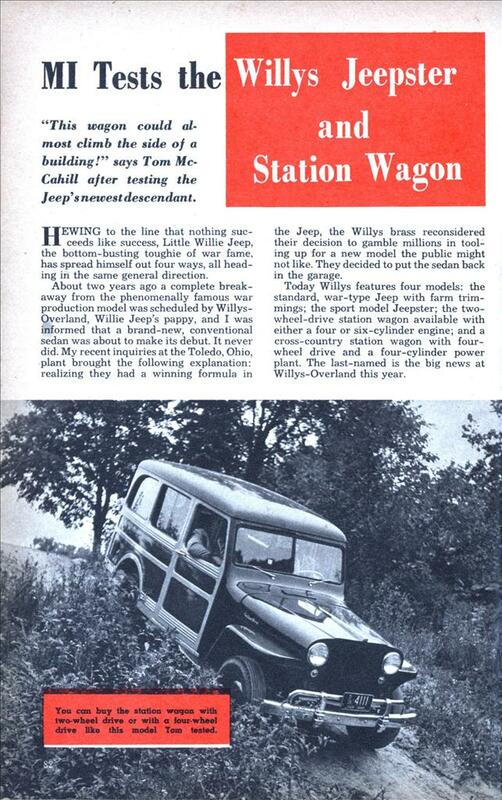 My recent inquiries at the Toledo, Ohio, plant brought the following explanation: realizing they had a winning formula in the Jeep, the Willys brass reconsidered their decision to gamble millions in tooling up for a new model the public might not like. They decided to put the sedan back in the garage. Today Willys features four models: the standard, war-type Jeep with farm trimmings; the sport model Jeepster; the two-wheel-drive station wagon available with either a four or six-cylinder engine; and a cross-country station wagon with four-wheel drive and a four-cylinder power plant. The last-named is the big news at Willys-Overland this year. There is no point in my reporting on the old reliable, farmer’s delight-type Jeep, since it is the same as the wartime prototype, nut for nut and jounce for jounce. So I concentrated my tests on the other three. Of them the new four-wheel-drive station wagon is the outstanding one. Off the road, this little brute really performs. There’s nothing else that can hold a candle to it for cross-country work, with the exception of its grampaw Willie. If you are planning a hunting safari through the bulrushes where the going would scare a mountain goat, this is your car. 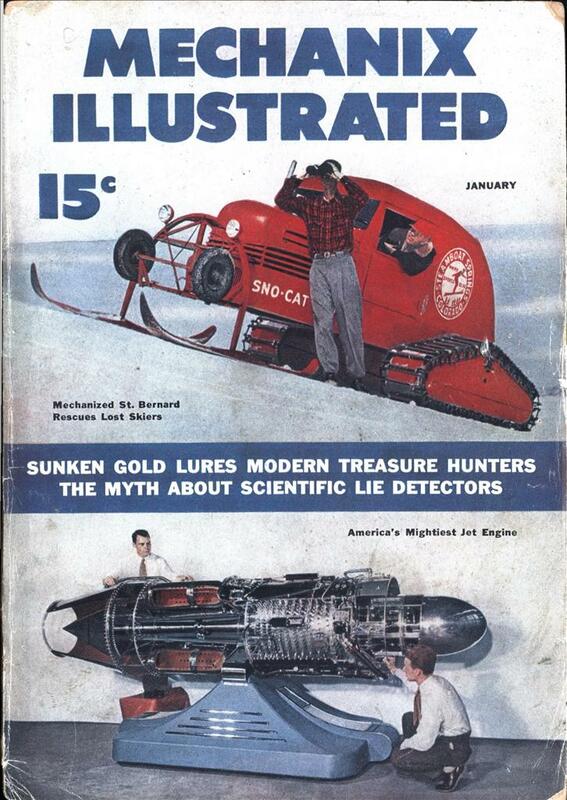 If you are a miner, oil prospector, rancher or explorer, this is it! I drove this four-wheel-drive wagon up and down 40-plus-per cent grades that would have stopped any other American-made vehicle in its tracks. I got the impression that this wagon could almost climb the side of a building. As for pulling out of mud, sand or snow—brother, it’s web-footed. Once I took it out of the fields and onto a smooth highway, though, my enthusiasm did a quick freeze. The front-wheel-drive axle assembly screamed like a leprechaun getting a hot foot, even though I was driving with only the rear wheels engaged. (The driver can use either two or four-wheel drive, as he chooses.) I made some inquiries about this noise and was told that the unit quiets down after a few thousand miles. Usually, but not always. Well, I liked their honesty, anyway. This car was designed for field work, so perhaps it wasn’t fair even to put it through any performance tests. I did anyway and was not greatly surprised to find that I could just about squeeze 60 mph out of it and that it took me approximately 35 seconds to get there from zero. An old Edison electric would have looked like a hot rod by comparison. But in its own element— over the fields and through the woods, where all the acceleration records are held by four-footed instead of four-wheeled travelers—this is the greatest car in the world, bar none. My next test was of the dandy of the Willys line, the Jeepster. In my opinion this car misses in three ways. First, the price, though reduced fairly recently, is still too high for what you get. Second, it’s underpowered. Give the Jeepster an engine that developed some horsepower and this could be quite a sporty job. With a Chewy or a Ford V-8 engine, this sturdy buggy could be something to write home about. As it is, there isn’t a production-line car made in America today, and costing more than $1000, that can’t top it in performance and usefulness. And third, it’s not a sport car and it’s not roomy enough for a general utility car—so what is it? As for the Jeepster’s looks, they’re like a taste for olives—they grow on you and you don’t know why you like them (if you like them) when you do. The side curtains are awkward. Putting up the top is supposed to be a one-man job but if you happen to have a couple of lady wrestlers with you, they’ll come in handy. At this point you may have gathered that I was not too impressed with the Jeepster. You’re right. But I do think it has an excellent potential. If Willys gave it a sexed-up power plant, and made a few other minor alterations, they might have something that could even rival the British Jaguar. The six-cylinder, two-wheel-drive, all-steel station wagon is similar to the four-cylinder job I tested over two years ago and which is, incidentally, still available. This model has proven to be Willys’ strongest contender as a popular passenger car. In every city and hamlet across the country you see thousands of these practical, gentleman trucks. In California I saw quite a few of them with East Coast license plates and I made it a point to question some of the owners about their trip out. Most of them were enthusiastic. But they all told me they had made the trip in slow jumps—300 miles a day in one of these conveyances might put you at the screaming point. This car also would be a lot more attractive to me if it had a little more engine to haul it. On the credit side of this criticism, though, I must admit that the standard-equipped overdrive collaborating with the small engine does produce an unbeatable gas-saving combination. And who isn’t interested in giving his pocketbook a break these days? The Jeep station wagon now has a serious rival in the new Plymouth all-metal utility wagon. This is underselling the regular Ford and Chevy station wagons by several hundred dollars which puts it right in Willys’ lap as a competitor. How can Willys-Overland sidestep this little issue? Well I don’t know. I wanted one of the 4×4 station wagons for my car but I could never find one on ebay and I never haul passengers so I got a postal jeep instead. But I still think the jeep wagons are one of the coolest looking passenger hauling vehicles ever made then or now! @ experiment 626 – I agree, I’ed buy one. @Hirudinea Oops! I should have said on ebay relatively close to me but you get it. It seems everything I like is on the east coast and I’m on the west coast and shipping cars and trucks sounds daunting. Anyways the only thing the Jeep would need to be better in my opinion is a diesel engine. @experiment 636: Imagine flying out, and driving one home. Say, 4 hours a day at 50 mph average. That’d probably be a two week trip (in a strange old car with unknown problems.) Call it a month to be safe. Adventure! My brother had one of the Jeepster convertibles in the late 70s. He bought it while in the Navy and stationed in Idaho. The thing used oil and he always said it got 20 miles to the gallon and 50 miles to the quart. On his way from Idaho to Connecticut, he stopped by home for a few days…. Someone in town saw it and offered him more then he had paid for it. He gladly sold it and took the train on to Connecticut. @Toronto I would love it! Hell I would drive the family rv out to wherever and tow it back home since a 50 foot rig does not scare me at all but my parents don’t like the thought of me going across the US since I’m only 21! and my parents have never heard of the word fun either. @MitchA He should have kept it!The jeepsters are rare and it would have been worth a lot now.